This past weekend simply begged for a special treat worthy of a grand celebration. Closing out my very first week at my new job...AND the arrival of my first big girl paycheck...meant that something sweet was definitely a necessity. Enter: Celebratory Cupcakes. Stuffed with a rich peanut butter filling and topped with a pillow of vanilla buttercream frosting, these moist chocolate treats were perfect for the occasion. Note: These tasty gems are also a good morale boost when your power goes out during a horrible heat wave, and you can't open your refrigerator to access your less indulgent food. In the midst of 100°+ temperatures in Virginia this weekend, a horrific storm pummeled our state, leaving over one million people without electricity. Thankfully, my power was only out for what seemed like forever 36 hours, which is nothing more than a little inconvenience compared to the week-and-a-half-to-two-weeks that my parents have been told they'll be without power. Yikes! So glad my friends and I had these goodies to enjoy by candlelight in my dark little apartment while we discussed the many things we're thankful for. Preheat the oven to 350˚ F, and line cupcake pans with paper liners. In a small bowl, combine the cocoa powder and hot water and whisk until smooth. In another bowl combine the flour, baking soda, baking powder, and salt, and whisk to blend. Melt the butter in a saucepan over medium-low heat. Place the sugar in a large mixing bowl and add the melted butter. Mix with an electric mixer until the mixture is cool, 1-2 minutes. Add the eggs one at a time, mixing well after each addition and scraping down the sides of the bowl as needed. Blend in the vanilla and then the cocoa mixture until smooth. With the mixer on low speed, add the flour mixture in three additions alternating with the sour cream (or yogurt), beginning and ending with the dry ingredients and mixing each addition just until incorporated. Beat together butter, peanut butter, and milk in a large mixing bowl. Add powdered sugar one cup at a time, beating well after each. When the cupcakes have cooled, cut a cone out of the top of the cupcakes and fill the holes with a small dollop of filling. Trim the bottom of each cone to fit over the filling and replace the little "caps." In a large mixing bowl, beat butter at medium-high speed until smooth. Add the confectioners’ sugar and salt, and beat at medium-low speed until most of the sugar is moistened. Add the vanilla and heavy cream, and mix at medium speed until incorporated. Then increase speed to medium-high and beat until light and fluffy, about four minutes, scraping down bowl once or twice. 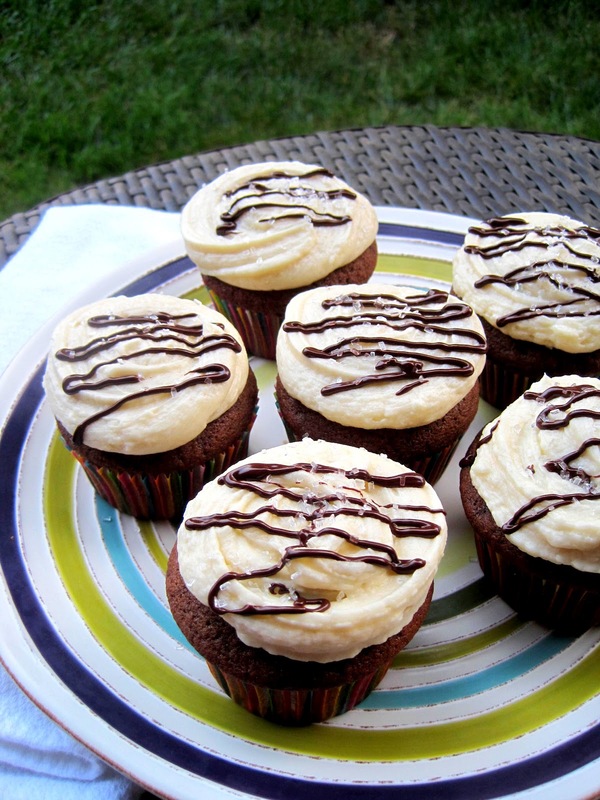 Using a pastry bag with a large tip, pipe a generous portion of frosting onto the top of each cupcake. Cupcakes adapted from Martha Stewart's Cupcakes via Annie's Eats, Filling adapted from Created by Diane. Frosting adapted from Cook's Illustrated via The Way the Cookie Crumbles. I've been browsing on-line greater than three hours as of late, but I by no means discovered any attention-grabbing article like yours.